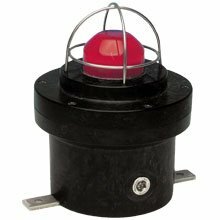 These certified beacons have been designed for use in potentially explosive gas and dust atmospheres and harsh environmental conditions. The glass reinforced polyester enclosures are suitable for use offshore or onshore, where light weight combined with corrosion resistance is required. voltages 24V - 48V d.c. 110V - 240 V a.c.
Class I, Zones 1 & 2, AExd IIB T4/T5. Exd IIB T4, T5 & T6. 2 x M20 cable entries or 2 x 1/2" NPT*. Earth continuity option (model dependent). †See FL11, FB11, FL12, FB12 datasheet.